Perhaps you’ve seen the long-stemmed plants with giant leaves resembling elephant ears. These exotic beauties, called elephant ear plants, or Colocasia in Latin, are native to warm climates, but they can be grown just about anywhere. Colocasia esculenta, the most common variety, has hundreds of cultivars in many different colors and patterns, and they lend any landscape that fun, tropical look. Colocasia esculenta isn’t just an ornamental plant either. In many places around the world, this species is grown as a food source. The roots, or tubers, of the plant have a potato-like consistency and can be cooked in a similar manner. Colocasia esculenta is known by many different nick names, including taro root, poi, potato of the tropics, eddo, djamandarrand and papachina. Read on for ten top tips on how to grow elephant ears in your garden. Learn about elephant ear plant care and how you can grow this popular species, even if you live in a colder climate. Growing elephant ear plants successfully depends largely on planting them in the proper location. Elephant plants can be grown as perennials in climate Zones 7 and up, and the Pink China cultivar can be grown in Zone 6. In Zones 1 through 6, elephant ears need to be planted as annuals. Because these are tropical plants by nature, elephant ears love moist locations. They do best around the edges of ponds or in boggy areas of the yard that might be too wet for other plants. The soil must be kept continually moist and not allowed to dry out. Elephant ears do best in filtered or indirect sunlight. You can grow elephant ears in full sun, but the edges may brown until they become acclimated to more light. They will also need more water when grown in full sunlight. If you live in a tropical climate, or in US Zones 7-9, you can plant elephant ears just about any time, although they may do best if you start them in the spring. If you live in a colder climate, spring is the time to plant them. Wait until all danger of frost has passed before setting them in the ground. 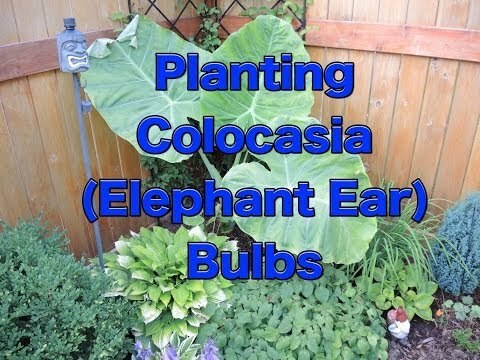 You can plant elephant ear bulbs or whole plants with the tubers attached, depending on how you buy them or if you are planting divided tubers saved from the previous year (see below). Plant your elephant ears deeper than you might other plants, about two to three inches below the surface of the soil, with the blunt ends facing downward. The plants will push up slightly as they grow, so you need to accommodate this when you first set them out. Leave approximately three to six feet between each plant to allow for mature growth, depending on how big your cultivars will be. Most elephant ear plants wind up at about six to eight feet tall, with leaves that span anywhere from two to four feet. Jack’s Giant elephant ear, for example, needs the maximum spacing between plants, due to its enormous and very striking leaves. Elephant ears thrive in rich soil that is full of organic food. Using a compost that is high in nitrogen is best. Try to prepare the soil before planting and add nutrients as needed throughout the growing season. Elephant ears require very little in the way of care, other than vigilant watering so they don’t dry out. As new leaves grow, the older leaves will die off. Simply cut these dead leaves off to preserve the aesthetics of the plant and to keep the old leaves from falling on the new leaves as they emerge. If yellow flowers develop, the elephant ear plant is going through its normal yearly cycle. It naturally has a period of dormancy during the winter, and it won’t require quite as much water during this time. While elephant ear plant is fairly hardy, you may encounter a few pests with this species. Spider mites seem to be drawn to them, but a good spray with the garden hose should remove them. If they persist, talk to your garden center about the best solution with the least amount of toxicity to you and the environment. enough water. Not letting your elephant ears dry out is the key to preventing these pests. See also other solutions to various problems with elephant ears. One thing gardeners love about elephant ears is that you can propagate more plants from just one. While it is possible to grown them from seed, it is far more efficient to divide the tubers, or bulbs, at the end of the growing season. You will need to do this anyway if you live in a cold climate. If you live in a warm climate where elephant ears grow all year long, simply dig up your plants and split them at the root, like you would many perennials with rhizomes. Then, replant the divided tubers with the appropriate spacing to create new plants. If you are growing elephant ears north of Zone 7 (or Zone 6 with Pink China elephant ear), you can dig up your elephant ear tubers and save them to replant the next spring. This should be done in the autumn, after the first frost. The plant should have started producing yellow flowers as it prepares for its natural dormancy season. Divide the tubers with a spade or garden fork, and cut off any foliage. Store the tubers with the soil still attached or in peat moss until the spring. Ideally, a cool storage location is best, between 45 and 55 degrees Fahrenheit, such as in an attached garage or protected garden shed. You can also overwinter your elephant ear plants in containers. If you are not already growing them in containers (see below), dig up your elephant ears before the first frost and replant them in large pots. They may be heavy with the soil and the size of the pot necessary, so consider placing the container on a plant dolly first. Place your elephant plant indoors in the same type of light it enjoys outside. Gradually withhold water from the plant, as this would normally be its dormancy season, so it needs less moisture. Take care not to over-water your elephant ears during the winter, as this can cause the roots to rot and the plant to die. Elephant ears inside the house can provide a wonderful bit of greenery and make you feel like summer has never ended. See more information about how to care for elephant ears in winter in this helpful resource. If you don’t have any yard space for elephant ear plants, you can still grow them in containers. Make sure to choose a pot deep enough for the roots and wide enough to provide a stable base. In cold climates, planting elephant ears in containers makes it extra easy to pull them inside when winter arrives. Containers of elephant ears, with their tall stalks and huge ears, make great privacy screening for decks and balconies. To fill in the bottom of the container, a plant like asparagus fern makes a great accompaniment with similar water requirements. 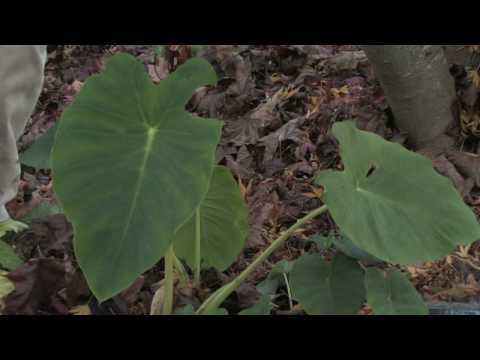 Elephant ears can provide great variety for your outdoor landscaping. If you have a dark corner of thegarden, look for a cultivar with lighter leaves to add brightness, like Mojito, with neon green leaves and dark splotches. To set off white flowers, try a cultivar with black leaves for a stunning contrast. Elephant ear plant’s low-growing cousin, Caladium, is a perfect pairing on the ground below. Caladium also comes in many different colors and patterns, so you can mix and match to your heart’s content. Many garden centers sell elephant ear tubers or whole plants if you live in warm zones. If can’t find a variety you like locally, you can purchase elephant ears online or from plant catalogues and have them shipped in protected packaging to you. Be sure to time your order to coincide with the right planting time for your zone, after any danger of frost has passed. Some people like elephant ears so much that they have whole gardens full of different varieties. If elephant ears are a novelty in your area, you may find your neighbors are curious about your plants and want to try them too. Once you have a few friends with elephant ears, you can divide and swap them for an even larger collection of cultivars. There’s no end to what you can do with these giant tropical showstoppers! What can I put on my elephant ear plants the bugs are attacking it and I just planted these from bulbs and I have one that has a leaf on it but something is eating at it! My elephant ear has been planted in the ground for about a month. How long does it take to see them sprout? If you purchased a bulb from your local store, it can take a little bit of time. When they dig them and prepare them for the market, they follow some kind of flash drying process which really sets the plant back and it will take longer to come out of it. When you buy from the store, also make sure there are no soft spots as this is decay and rot and when planted could destroy the whole bulb before it gets a chance to start to grow and get healthy enough to fight off the rot. You should see something shortly depending on how deeply you planted. it. I have had the same problem. I started them this year in pots in our greenhouse which you can do in a sunny room. It takes somewhere like 6 weeks before they take off once the ground is really warm they will take off. This year I am going to file down the end where roots sprout to see if this makes the bulb grow faster …Good luck! Warm soil is the key, I think…. What is the difference between a runner and a root?? ?cause if I have a runner I’d like to grow another elephant ear with it. How can I tell??? my plant leafs getting yellow and dry I don’ what cause it ? What do I do with my elephant ear plant during the winter? They are in the ground. Do I cut the leaves off? I have an indoor elephant plant. One stem has turned red and broken off. Should I cut it off completely? Will this affect the rest of the plant, which right now, is doing well? My elephant ear plant in its container grew HUGE this past summer! Should I cut it back and bring it into the house, or just keep t huge and brng it into the house? Or should I cut it back and put it in the unheated garage to go dormant? I have a 4 in EE planted outside and now the leaves are drooping. We got alot of rain lately….no water needed. It is winter time. Should I dig them up? I have a plastic container over it. I planted my Elephant Ear bulb in a pot….Now it keeps mildewing on the top dirt around the bulb…Why? What are those freaky looking cabbage things that come up before the stalks?? I just moved and found that I have an Elephant Ear plant that is now 6 feet tall. It is growing underneath a stairwell to an upstairs apartment and soon will interfere with the steps. There are dead leaves that I learned can be cut off and leaves that are extending so far out onto the walk way. The plant needs TLC and I need to know if it can be cut back somehow without killing it or if it has reached the point of just removing it. The bulb is enormous and I don’t think this plant has been taken care of in years and wonder just how deep the roots are. I live in south Florida and am concerned about my giant thailand elephant ear being invasive. It has a few “babies”. How do I keep it from spreading? I love the plant. It is now about 6 feet tall.